It only made sense. For millennia, farming has occurred on a two-dimensional plane in the form of rolling or flat, soil-laden fields. This worked well in areas with abundant arable land, suitable climate, and ample fresh water from rain or irrigation. But with available land, fertile topsoils, and water becoming scarce, and concern growing over pesticide and fertilizer use and the energy and pollution costs of transporting produce, new kinds of agriculture are gaining attention. One obvious possibility is a three-dimensional framework in a controlled indoor environment. Coining the term “vertical farm,” Despommier, now professor emeritus, continued to engage students with the idea and in 2010 turned it into a book, The Vertical Farm: Feeding the World in the 21st Century. The concept is a long way from displacing conventional agriculture, but it has inspired research, start-ups, and pilot projects in the United States, Europe, and Asia, along with imaginative artists’ renderings. “It’s an idea that’s talked about a lot. It’s still very much an emerging field where there are not that many commercial operations, especially on a larger scale,” says Neil Mattson, associate professor at Cornell University in the Horticulture Section of the School of Integrative Plant Science in the College of Agriculture and Life Sciences. While Despommier envisioned 30-to-40-story establishments, current-design vertical farms typically occupy one or more stories of a building with up to 12 layers of short-statured plants stacked in trays on each floor. The plants are grown using hydroponics, aquaponics, and aeroponics. Hydroponics involves submerging the roots of the plant in water, while aeroponics is suspending them in air and bathing them with mist. Aquaponics gets into aquaculture, where you raise fish such as tilapia in the water, and nutrients, oxygen, and carbon dioxide are exchanged in a symbiotic relationship. Most vertical farms use some form of scissors lifts, ladders, or stairs, rolled around manually, to access the plants to maintain and harvest them. Most of the crops grown are leafy greens such as lettuce, spinach, kale, and basil. Penny McBride, vice chair of the Association of Vertical Farming based in Munich, Germany, says “a lot of criticism has been that people are mostly growing lettuce. That’s largely because the amount of time it takes to grow lettuce is shorter. So they can grow it quickly and get it out the door.” But McBride says you could grow carrots and vining crops like peppers, beans, and cucumbers, along with tomatoes, strawberries, and medical herbs. In theory, corn and wheat could be grown as well as biofuel crops and plants used to make drugs. Transplanted seedlings are also developed, and the industry is interested in cannabis, mushrooms, and edible flowers. Vertical farming offers many advantages over conventional farming, McBride contends: “It is appropriate closer to large population centers. You get more production on a smaller footprint.” Indoor farming can increase crop yields 10 to 100 times over a similar footprint outdoors. Likewise, transportation of warehouse-grown crops is negligible since they are mostly consumed near where they are grown. Growth takes place at twice the rate of outdoor farming, and at least 70 percent less water is used than with conventional agriculture. Overseas, Japan makes an ideal candidate for vertical farming because its terrain is 75 percent mountains, with the bulk of the country’s population concentrated in the remaining 25 percent. Mirai in Tokyo ranks as the world’s largest indoor farm; the former Sony semiconductor factory ships out 10,000 heads of lettuce a day. In the same city, the human resources company Pasona refurbished a 50-year-old building, with one fifth of its 215,000 square feet devoted to growing fruits, vegetables, and rice, according to the online publication Inhabitat. In the crowded city-state of Singapore, Sky Greens claims to be the world’s first low-carbon, hydraulic-driven vertical farm. In Linköping, Sweden, meanwhile, a firm called Plantagon says it plans to erect a 16-story “plantscraper,” with offices on one side and on the other, a vertical farm in which crops will be grown hydroponically using both LEDs and natural light. The firm recently opened a 65,000-square-foot farm in the basement of a Stockholm office building, according to Huffington Post. In the United States, one of the fastest-growing ventures is AeroFarms, based in Newark, N.J. The company recently started its ninth farm, billed as the world’s largest vertical farm, at its new global headquarters, and it has others in development in multiple U.S. states and on four continents. McBride cofounded and is part owner of Vertical Harvest of Jackson in Jackson, Wyo., one of the world’s first vertical greenhouses. Located on a sliver of vacant land next to a parking garage, the 13,500-square-foot, three-story facility uses a tenth of an acre to grow produce equivalent to five acres of traditional agriculture and supplies it fresh to local grocery stores and restaurants. The top floor grows tomatoes, which require lots of light, while the lower two layers have rotating shelves of leafy greens that get sunlight through windows and artificial light when they’re rotated farther into the building. Working with the University of Wyoming, Vertical Harvest produces 100,000 pounds of produce each year. Racks of plants extend through the floors, so employees can tend to them from each floor. Across the state in Laramie, entrepreneur Nate Storey launched the vertical farm Bright Agrotech after earning an agronomy doctorate from the University of Wyoming. His company has since been acquired by a Silicon Valley firm, Plenty. Vertical farms might be suitable for population centers like Las Vegas, where land is inhospitable to farming and produce must be trucked in from California. Within universities, research on vertical farming falls under controlled environment agriculture (CEA), a term Mattson says encompasses both greenhouse production and plant factory and warehouse-style production. “It’s a combination of controlling and manipulating the environment to optimize it for plant production and then combining that with horticulture practices,” he says. 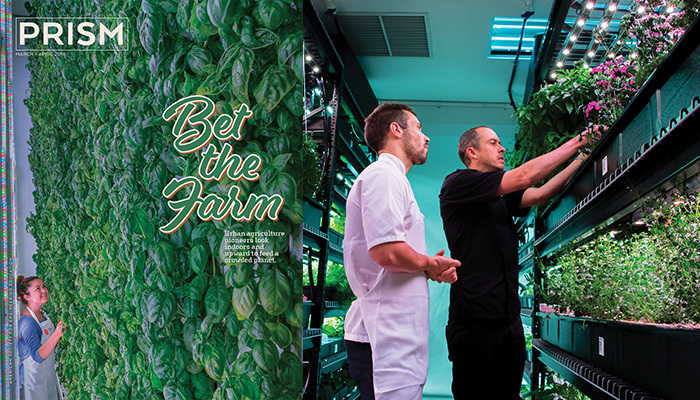 The University of Arizona’s Controlled Environment Agriculture Center (UA-CEAC) recently launched a new two-floor vertical farm known as the UAgFarm for research and to provide experiential educational opportunities for students and educate growers and the public on indoor growing systems. It occupies 750-square-feet with two individually controlled chambers, one on each floor, with two racks, each with two layers of floating, raft-based hydroponic systems. Undergraduate and graduate engineering students designed the systems for it. “For a research institute, this is a large-scale facility,” says Kacira. “When we are at full production, we have 2,000 heads of lettuce or basil at once.” The new farm is in addition to the 20-plus computer-controlled greenhouses at UA-CEAC, which provides education, research, and extension activities, and is heavily involved with the school’s Agriculture and Biosystems Engineering, Plant Sciences/SWES, and Agricultural Technology Management departments. Other colleges involved with CEA and vertical farming include the University of Florida, Ohio State, Michigan State, North Carolina State, MIT, and Purdue. One example of a product Mattson’s group is examining is tomatoes. The team will compare samples produced in a vertical farm in or near New York City with tomatoes shipped from conventional farms in Florida, California, and Mexico. Perhaps the most important factor in determining whether a vertical farm will be financially viable is the energy required to operate it. “One of the biggest criticisms of indoor farming is the energy use,” McBride says. “One thing AVF is doing with some of our university partners is looking at how we can set baseline standards for lighting, energy use, and water use.” Arriving at a real comparison with conventional farming, she says, would require comparing the energy a vertical farm requires for heating, cooling, lighting, and water consumption with the fuel needed to operate a tractor in an open field. HVAC systems rank as one of the largest energy users in vertical farms. Kacira says, “You have to maintain air temperature, humidity, and carbon dioxide levels; it’s a challenge to control the three. It requires special HVAC systems, and it requires an understanding of plants. There’s room to engineer these systems to make them more energy efficient.” Air distribution is difficult, as well. “We need to design more dynamic air flow systems.” Vertical farms consist of plants stacked in layers, and indoor spaces often stratify into layers of varying temperature and humidity. The cost of energy convinced Utah State University’s Bruce Bugbee that vertical farming “won’t save the planet, and it is not going to replace field agriculture.” A botanist who has spent decades studying how to grow food in outer space for NASA, Bugbee is clearly not averse to bold experiments. But in a seminar archived on YouTube, he says of vertical farms: “If we’re going to do urban farming and indoor farming under electric lights, we’ve got to come up with a lot of money to pay the electric bill. . . . You can have a vertical farm if you let me have a nuclear reactor right next to it.” Using solar power would require 5.4 acres of panels for each acre under cultivation, he says. If electrical engineering advances have yet to make vertical farms ecologically pristine, they have made it more efficient. With the improvements in LED lights in recent years, they have become the technology of choice. Compared with T5 fluorescents, LEDs double the efficiency. And researchers can more easily control LED lights to do things like change colors and turn them on and off. Plantagon, the Swedish firm, says 70 percent of the heat from LEDs in its basement farm can be piped into the heating system of the office building above, Huffington Post reports. Robotics and automation also loom large in vertical farms, although McBride expects a combination of manual labor and automation will be needed. Most plants are harvested by hand. But since they have different lighting requirements at various stages of their life, either the plants or lights need to be moved around. “The tech industry is stepping into the space, so monitoring and automation are changing,” McBride says. “Discussions have centered on whether it’s better to have the plants come to the workers or use a lift system to get the workers to the plants. There has to be some place in between. We’re getting to more and more of a sweet spot of where that lies.” This is a tricky area because it is harder to justify capital spending on robotics to grow plants than to produce high-return manufactured goods like electronics or cars. One production method has plants in trays that flow along a narrow pond like rafts. You can place a raft on one end of the production system, and the crop keeps getting pushed along so that you harvest from the other end when they reach maturity. You can adjust the lights above the crop to deliver light intensities or spectral qualities needed at different stages along the flow path. As interest in vertical farming grows, it’s likely to engage faculty from a number of fields. “I am not a vertical farming researcher per se, but the tools and technologies we have produced can be used for that,” says Joshua Peschel, assistant professor and Back & Veatch Faculty Fellow in agricultural and biosystems engineering at Iowa State University. He specializes in phenotyping, which involves using computer vision techniques to take three-dimensional images of plants to measure physical characteristics, such as height, stem diameter, leaf angle distribution, leaf orientation, and color, that can be affected by genetic and environmental conditions. If we’re a long way from cities dotted with 40-story farms, the progress of vertical agriculture to date shows such gardens are certainly possible—and a source of inspiration to the next generation of engineers. Based in Milton, Pa., Tom Gibson, P.E., is a consulting mechanical engineer specializing in machine design and green building and a freelance writer specializing in engineering, technology, and sustainability. He publishes Progressive Engineer, an online magazine and information source.